Flooding is the tragic norm in Jakarta, a megacity where major floods took 40 lives and cost IDR 32 trillion ($2.4 billion) in 2013. The floods were back early this year, and more are expected. Southeast Asia's biggest city is investing in dams, widening river channels and other built infrastructure to tame the floods. But the city's natural infrastructure has also taken a beating. The surrounding forested watershed would ordinarily store and slowly release rainwater promote aquifer recharge, stabilize soil and stem erosion. While managing water in the city itself is critically important, it is also equally important to manage its upstream watersheds in order to truly protect against flooding and water stress. Ironically, deforestation of these watersheds leaves Jakartans at the mercy of extremes. In between floods, the city is left struggling to meet surging demand for water, in part because deforestation slows the ability of local aquifers to recharge. One of the major rivers that runs through the heart of Jakarta is the Ciliwung River. It runs 120 kilometers from the upper watershed in Bogor, where the remaining forest lies, to the coast of Jakarta. Once healthy, this river now suffers from heavy pollution, excess silt and man-made changes in river structure. 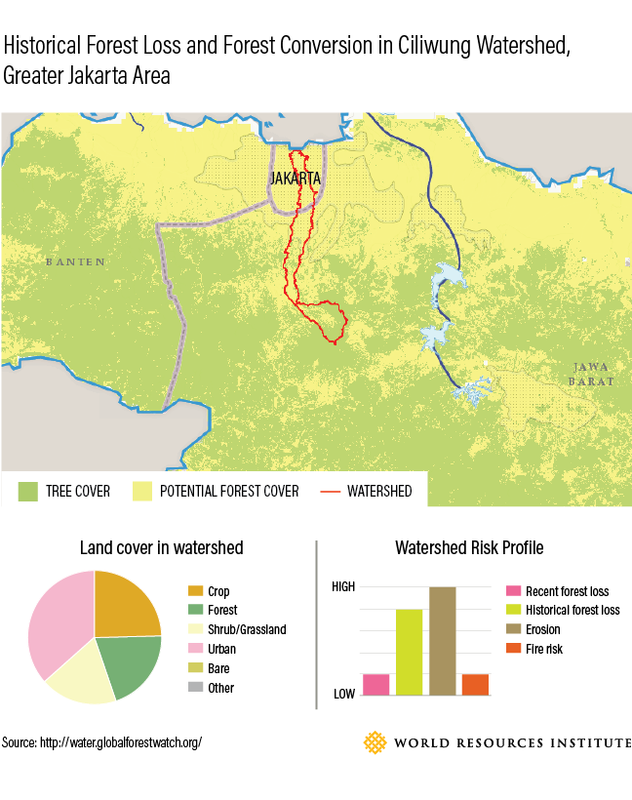 Threats to the river's watershed can be closely examined using the recently launched Global Forest Watch Water, a global mapping tool and database that examines how tree cover loss, unsustainable land use and other threats to natural infrastructure affect water security throughout the world. 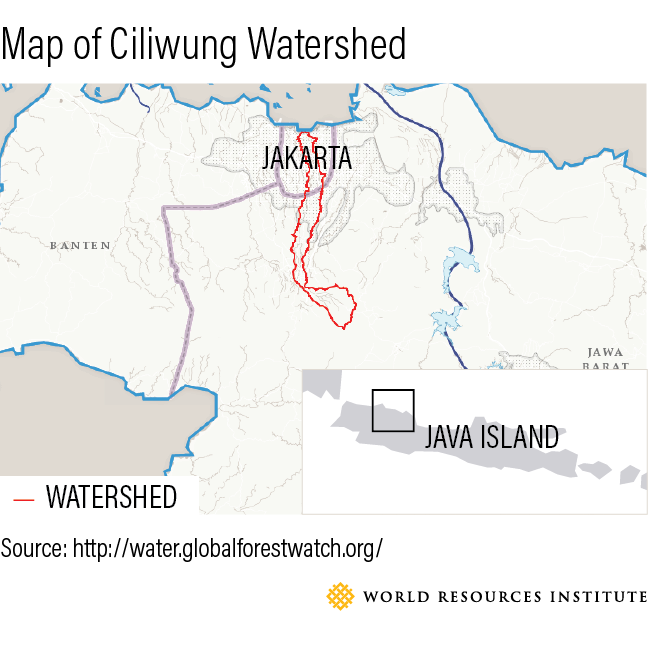 Most of the forest in Ciliwung watershed is in the upper watershed. Although the watershed is still partially forested, degradation has dramatically reduced the watershed's capacity to regulate water flow and control water quality. GFW Water data shows that the watershed has experienced a high rate of historical tree cover loss, most of which occurred prior to 2000. Additionally, more than 50 percent of the watershed is already converted to urban or agricultural land. Without the trees, grasses, and root structures needed to capture and water and hold soils the upper Ciliwung watershed's capacity to retain water from heavy rainfall has been drastically reduced. Consequentially, the downstream city of Jakarta now experiences less flood protection from this natural landscape. Flooding is only one half of Jakarta's water story. Thirst is another. The city's baseline water stress score of 4 to 5, is considered extremely high. This score means that more than 80 percent of the available surface water supply is withdrawn. 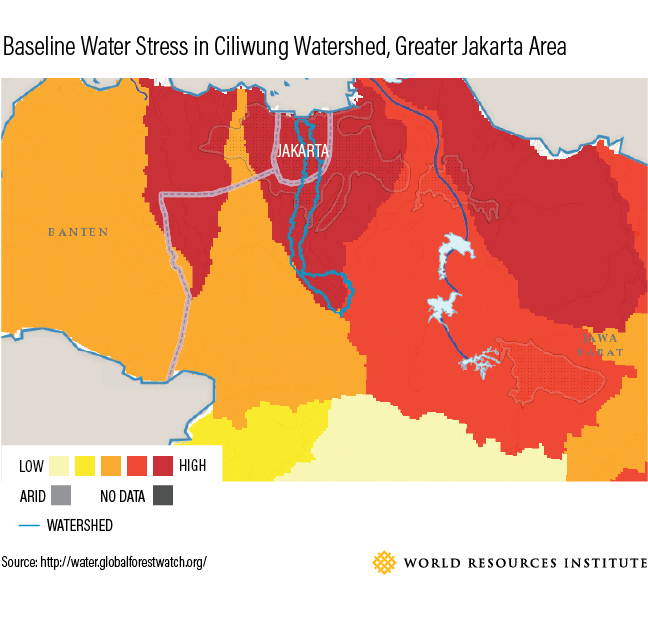 High baseline water stress indicates that Jakarta already experiences high competition for water among sectors, impacting important water-dependent sectors such as agriculture and energy and leaving less water for essential ecosystem services. It also makes Jakarta more vulnerable to increased demand and drought, and has forced it to turn increasingly to groundwater. Jakarta also already experiences extreme groundwater depletion. This is in part due to millions of Jakarta residents who extract water through wells from shallow underground aquifers beneath the city. But it's also due to the fact that, without greenery that helps the watershed retain water, aquifers struggle to recharge at typical rates, compounding the depletion caused by public demand. It's also quite literally causing the city to sink: high rates of water extraction and development have caused the city to drop, on average, 4 inches (10 cm) annually. This trend, called subsidence, causes damage to infrastructure and will continue if massive extractions continue to be poorly regulated. Subsidence also raises flood waters because the land surface is depressed, allowing rising seas and storm surges from climate change to further swamp the city. Jakarta's water landscape is one of both scarcity and excess—pairing high water stress with flooding worsened by watershed degradation. However, there are plenty of solutions for how the city can reduce these risks. The GFW Water tool provides recommendations and plans for actions based on each watershed's individual water risks. For Jakarta, these recommendations include reforestation, assisted natural regenerations through protection as well as preservation of natural tree seedlings, and agroforestry. The city is already acting by piloting innovative solutions to protect the areas that surround the city. For example, a payments for environmental services scheme in Cidanau watershed, West Java, has used revenue from water pricing collected by a multi-stakeholder organization to fund reforestation in upper stream areas, which helps to ensure clean water for the areas downstream. Jakarta alone cannot solve its flooding and sinking. The city will also need to collaborate with surrounding areas to reduce both crises. 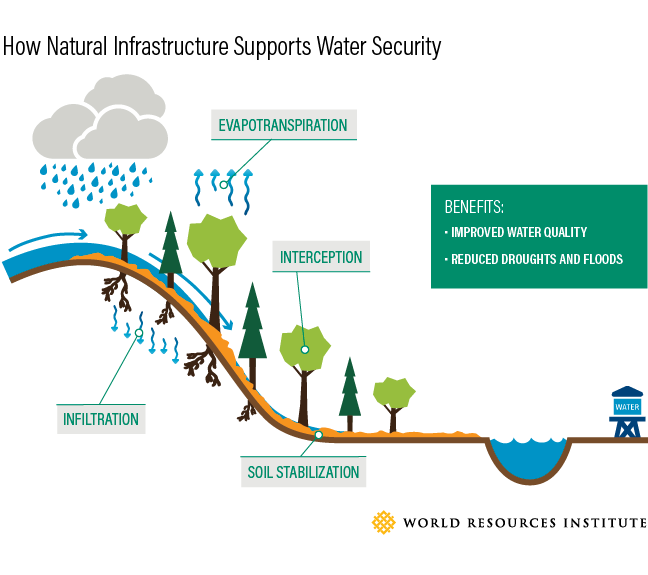 To protect against floods, and ensure aquifer recharge, Jakarta can support restoration of natural infrastructure in upstream areas in West Java. To reduce groundwater extraction, the city government can regulate water extraction in Jakarta and work with water companies to provide infrastructure to houses and buildings to reduce groundwater extraction. These solutions, if taken together, could turn Jakarta's current environment of water extremes into one of water security.